Perhaps best known for reaching the finals of 2015’s Masterchef: The Professionals, Danilo Cortellini has held the position of Head Chef at the Italian Embassy in London for the last five years, and published his first cook book last year. Showcasing the chef’s ‘quintessential, contemporary Italian’ cooking as well as the beauty of Italian produce and dishes – 4 Grosvenor Square: The Menu of the Italian Embassy in London features a number of recipes. These include the likes of puntarelle salad with burrata cheese; stuffed red mullet with caponata and smoked buffalo mozzarella sauce; plus, the chef’s signature multi-coloured pasta, of course. 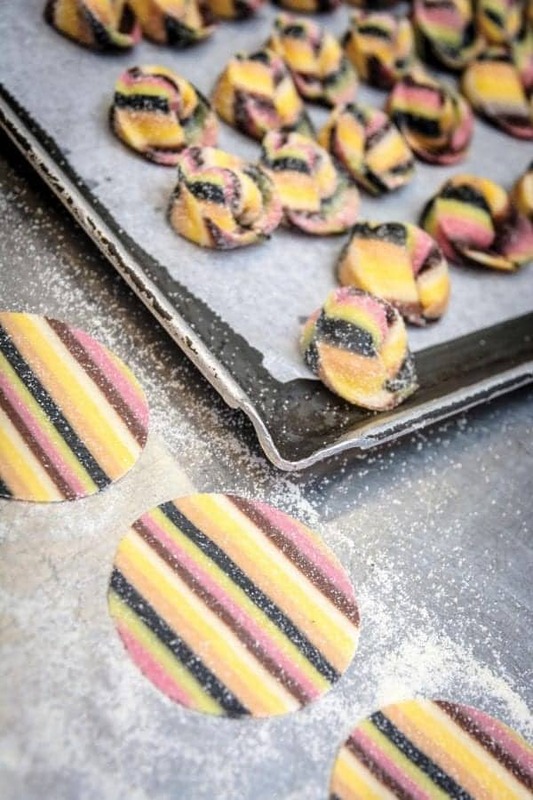 Following the book’s release, Danilo has adapted a multi-coloured pasta recipe for readers to make at home. This recipe calls for the pasta to be formed into ricotta-filled ravioli, served with a sage, butter and Grana Padano sauce. Buon appetito! Knead the egg with the flour until it makes a smooth and elastic dough. You only reach the right consistency if the pasta has been worked hard enough to allow the gluten molecules to break down; the dough’s elasticity is very important for the final result. Wrap in cling film and let it rest for 30 minutes. Blanch the parsley leaves in salted boiling water then cool in iced water to retain their colour. Blend the cooked parsley with eggs and knead the egg mixture with the flour until smooth and elastic. It should have the same consistency as the yellow pasta. Blend the beetroot well with the beetroot juice and the egg. Knead the pink egg mixture with the 00 flour until elastic and smooth. If a pasta is too dry, add a bit of egg. If the pasta is too wet, add a little flour. Roll out 3 sheets of the same thickness through the pasta machine for each colour. The thickness of the sheet will correspond to the thickness of the coloured stripe. Once all the pasta doughs have been rolled out, proceed to stack the coloured sheets on top of each other. Make sure that there is no flour caught between the layers. Cut the layered block in half and stack the second half on top of the first block. This process can be repeated if necessary. Wrap the block in cling film and let it rest in the fridge for approximately 4-5 hours. To obtain a beautiful striped ravioli, cut a thin slice of pasta from the block. Roll it out lengthways once or twice through the pasta machine: the stripes should be perpendicular to the pasta machine. Following this procedure, you can create all sorts of beautiful shaped pasta. Roll the pasta very thin, cut 8cm diameter ring and place a spoon full of ricotta in each ring, brush the edge with water. Fold it and pinch the edges. Boil the ravioli in salted water for a couple of minutes. In another pan melt the butter with a pinch of salt and add the sage. Drain the ravioli directly in the pan and add a ladle full of cooking water, dress with Grana Padano and serve. 4 Grosvenor Square: The Menu of the Italian Embassy in London (Meze Publishing Limited, 2016) is available now. Further information can be found at danilocortellini.com.